Personalized Temperature Clock Calculator Calendar CustomPrinted in Bulk. Promotional, Very Inexpensive. Lowest Cost in USA, Canada! Thermometer clock calculator calendar, custom imprinted with your logo or message. We also supply wholesale blank (not imprinted) thermometer clock calculators for $2.20 each. Budget Prices in the USA and Canada for thermometer clock calculator calendars. American clients pay no taxes, we will send you a proof for your approval before production. Prices include a 1 color, 1 side imprint. Set up charge is $50.00 per IMPRINT color. Extra Imprint Colors: add $0.50 per color. 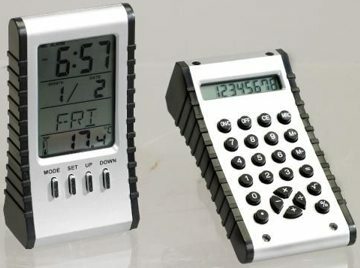 Digital calendar, alarm clock and thermometer on one side and a calculator on the other side. Batteries included. Great novelty at an amazingly low price! Hard Plastic Sides. Size: 2 3/8" by 4 1/2". Imprint Area : 1/2" x 1-1/2"
Packaging: bulk; 100 units per carton of 24 lbs. Production Time: 5 days after art approval; Rush production is available: contact us. Blank thermometer clock calculators ship next day.